War game introduces early synthetic prototyping, which enables the Army to explore thousands more ideas than what is possible today before acquiring new capabilities. A group of cadets has some rare downtime, and they log into their favorite war-themed video game. The team has to capture a watch-list terrorist in a 40-story high-rise building in Mumbai, India. It’s rainy season in the game, meaning that sometimes the streets flood en route from the edge of town. A tracked vehicle that can carry heavy armor and drive over obstacles. A light wheeled combat vehicle that’s maneuverable but has limits on armor and weapons. A self-driving taxi appropriated by the cyberwar team that will blend in with the locals but has limited exportable power and can be only slightly up-armored. This team opts for the hacked taxi. Next, players move to the virtual garage to kit out their vehicle using their remaining virtual cash. The cadets decide against adding armor to their already slow taxi and instead choose soft exoskeletons to wear when they dismount. Soft exoskeletons use belts and small motors to augment the operators’ own movements, and will let them ascend stairs effortlessly. They know from past attempts and from watching replays of the best games on the leaderboard that the full-up exoskeleton, which can knock down doors and provide lots of armor, runs out of power running up a stairwell around the 14th floor. They’ve also learned that a small drone swarm can send back situational awareness floor by floor as they ascend. So they spend their last cash on the swarm launcher. Still, the enemy will create surprises, as the opposing force is played by another group of Soldiers. Members of the team aren’t in the same room or even the same physical location, but they feel like they are as they don their headsets and take friendly jabs at each other. The future video game the cadets are playing isn’t “Call of Duty,” but rather the Army acquisition-focused game “Operation Overmatch,” which is the first product in a larger program called early synthetic prototyping (ESP). ESP is a collaborative effort of the U.S. Army Training and Doctrine Command’s (TRADOC) Army Capabilities Integration Center and scientists from the U.S. Army Research, Engineering and Development Command (RDECOM). Operation Overmatch may provide a level of entertainment, but its main goal is to prove out technologies before the Army spends development dollars. ESP enables the exploration of thousands more ideas than what is possible with physical experimentation done today. The scenario above isn’t yet feasible, as Operation Overmatch is still developmental and in beta testing, but the initial release should go live in 2019. Developmental vignettes in 2018 will focus on the Squad Multipurpose Equipment Transport and Next Generation Combat Vehicle concepts. While the new Futures Command hopes to streamline bureaucracy, and legislative changes may unshackle program offices, the Army still will not be able to keep pace with commercial technology development cycles. Our military has been driven by technological overmatch for 100-plus years, and suddenly commercial military-relevant technologies are available on the global market. In fact, commercial research budgets in robotics and artificial intelligence far exceed DOD’s. That means the future Army must focus on time-domain overmatch—ingesting and fielding technology much faster while simultaneously learning to employ technologies on the battlefield more effectively than our adversaries. The ingestion of new technologies requires a lot of experimentation, and ESP will allow the Army to tap into the creativity of thousands of Soldiers. As a persistent crowd-sourced game network focused on acquisition, ESP allows Soldiers to explore the trade space for performance requirements, force structure and tactics. Pure technology “widgets” are easy for an adversary to duplicate. The hardest thing for adversaries to duplicate is the integration of advanced technologies with skilled Soldiers and well-trained teams. ESP is not a simply a matter of writing a new video game, as nothing exists for the Army that Soldiers might play anywhere and that logs every event, communication and entity position in the game. There is also a lot of challenging research to do on how to rapidly insert new concepts into the game, integrate realistic physics and turn millions of hours of game play into data useful to decision-makers. Operation Overmatch, the first ESP product, is a first-person shooter game focused on small unit operations. The hope for ESP is to tap the fact that Soldiers already spend a lot of time playing video games and seem especially willing to play something that helps design the future of their Army. Survey data from an ESP pilot study at Fort Bliss, Texas, indicates a potential of a million hours of game play a month in off-duty time. The Fort Bliss test found that more than 87 percent of Soldiers played video games, and that 50 percent of Soldiers played more than 10 hours of video games per week. Operation Overmatch is collecting all telemetry (player positions and events) and the players’ technology selections. The eventual 12 million hours of data per year will require machine learning and big data techniques to analyze and derive useful data on tactics and performance. In the alpha version of ESP, Soldiers play eight versus eight against other Soldiers, fighting advanced enemies with emerging capabilities in realistic scenarios. 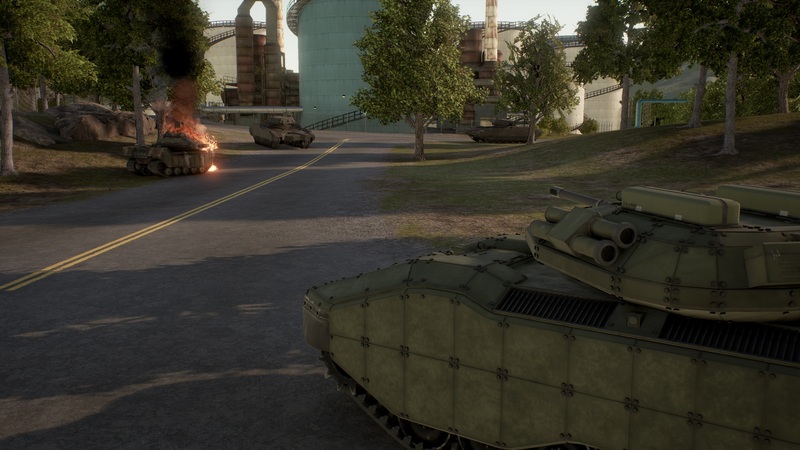 Players will soon be able to experiment with weapons, vehicles, tactics and team organization. Presently there are no dismounted Soldiers in the game; they will be added over the next year along with other new features. The game currently provides a discussion area so that innovative ideas might spawn even more ideas. First, concept and capability developers, as well as scientists and engineers from across the Army, suggest various theses on force employment, force design and materiel capabilities. RDECOM engineers then model ideas in the game environment with an appropriate amount of physics rigor. The engineers, in turn, work with TRADOC to create scenarios that address what the Army wants to learn. For example, the Army may want to explore how best to equip and employ future platoons in an airfield seizure against a near-peer threat. Next, the game is distributed to Soldiers across the Army via Steam, a widely used platform for the delivery of digital games. Steam handles digital rights management, installation and automatic updating of games. Players can learn how to use and modify the equipment in single-player missions before engaging in multiplayer scenarios. Some Soldiers will play as an opposing force using emerging threat platforms, and some will play as U.S. warfighters. Following each scenario, the players can provide feedback about what they liked or disliked and make recommendations. Additionally, the game server collects game data for analysis. This process is intended to repeat continuously with changing equipment, scenarios, organization, goals, rules and objectives. ESP provides an immersive, high-bandwidth communications tool for engineers and Soldiers to co-create solutions within a digital operational assessment loop. It will provide measured effectiveness data to decision-makers. To enforce realism, engineers create high-fidelity, computer-aided engineering simulations that are turned into performance tables to allow realistic physics during game play. Scenarios are simultaneously developed over a given mission set. Players use a design mode to construct a unit or platform (a vehicle, in this case) that they believe will best achieve the mission. Virtual budget constraints ensure that Soldiers do not simply pick the most high-tech solution. ESP should help inform trade space tools such as the Army’s Whole System Trades Analysis Tool and the Marine Corps’ Framework for Assessing Cost and Technology. ESP warfighting data will enable data-centric rank ordering of performance requirements instead of relying on subject matter experts’ opinions. The game data collected from teams trying various technology combinations over multiple missions can be used to measure the mission success of requirement X versus requirement Y. A mathematical tactical utility metric may be newly defined as probability of mission success ÷ total burden. ESP is poised to help DOD achieve an enduring time-domain overmatch even if U.S. adversaries achieve technical parity in fighting technologies. ESP provides a rapid digital assessment framework to measure progress toward mission accomplishment through test and evaluation in an operational context. For future robotic systems, ESP will help train superior artificial intelligence behaviors and optimize their integration into the force. ESP should greatly boost DOD’s ability to ingest technologies from anywhere and figure out how to use them in the fight. The Army then can rapidly turn the technologies over to Soldiers who are readily able to employ them on an evolving battlefield. ESP is not a simple matter of writing another video game, however. There are many challenging research questions, many unfunded, that the Army is trying to address. For more information, go to http://www.operationovermatch.com or contact the authors at robert.e.smith1699.civ@mail.mil and james.p.barnhart.mil@mail.mil. ROBERT E. SMITH is a research engineer in the U.S. Army Tank Automotive Research, Development and Engineering Center (TARDEC), Detroit Arsenal, Michigan. He works in the Modeling and Simulation Group (Analytics) and has 20 years of experience in computer-aided engineering. His career includes experience at Ford Motor Co., Whirlpool Corp. and General Dynamics Land Systems. He holds a Ph.D., an M.S. and a B.S. in mechanical engineering from Michigan Technological University. His research interests include big data, machine learning, signature management, computational heat transfer and innovation in design and engineering. He is Level III certified in engineering and is a member of the Army Acquisition Corps. MAJ. J. PETER BARNHART is the project lead for ESP at the Army Capabilities Integration Center, Joint Base Langley-Eustis, and Virginia. Commissioned an armor officer in 1998, he served as a cavalry officer, commanding Soldiers in Operations Iraqi Freedom and Enduring Freedom, before becoming an FA57, simulation operations officer. Since then, he has served as a models and simulations planner at the Joint Multinational Simulation Center in Grafenwoehr, Germany, and as a chief knowledge officer with the 25th Infantry Division. He is a graduate of the Armor Officer Basic Course, Maneuver Captain’s Career Course and U.S. Army Command and General Staff College. He holds an M.S. in information technology from the University of Maryland University College and a B.A. in anthropology from the University of Guam. His current research interests include evolutionary anthropology with respect to the peopling of the Earth, game theory and evolutionary process, systems analysis and design methodology, systems biology and cyber defensive tools. He is a member of the Office of Circumlocution on milSuite.